This book may be read as a standalone novella. You do not need to have read either series to enjoy. The Rose Gardner Series and the Ghost-in-Law Series combine to bring you a rollicking round of holiday fun! Rose Gardner and Neely Kate Colson are thrilled with Mason’s early present to Rose—a trip for the two of them to New Orleans for shopping, great food, and awesome seats to Wicked. Neely Kate plans to use the opportunity to visit a psychic and find out once and for all what her paranormal ability is. 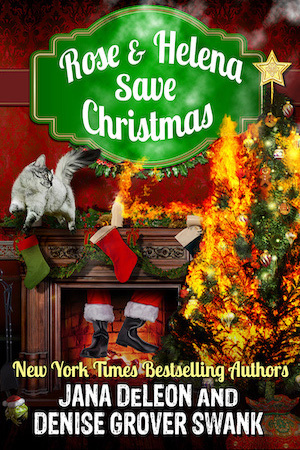 But when the psychic is murdered, and Neely Kate and Rose were the last people to see her alive, they find themselves the main suspects in a Christmas killing. Taylor Beaumont has exhausted all resources in trying to figure out her new ghostly roommate, Helena. Seeing a psychic is the last resort. Taylor hoped for answers about Helena’s worldly existence but, instead, finds herself embroiled on the wrong side of a murder investigation. Seeing no other option, Taylor and Helena combine forces with Rose and Neely Kate to clear their names. But can they solve the mystery in time to save Christmas?